The Texas Stars beat the San Antonio Rampage last night with an amazing win of 6-1. The Rampage have given the Stars fits this season and they got some payback in a big way. 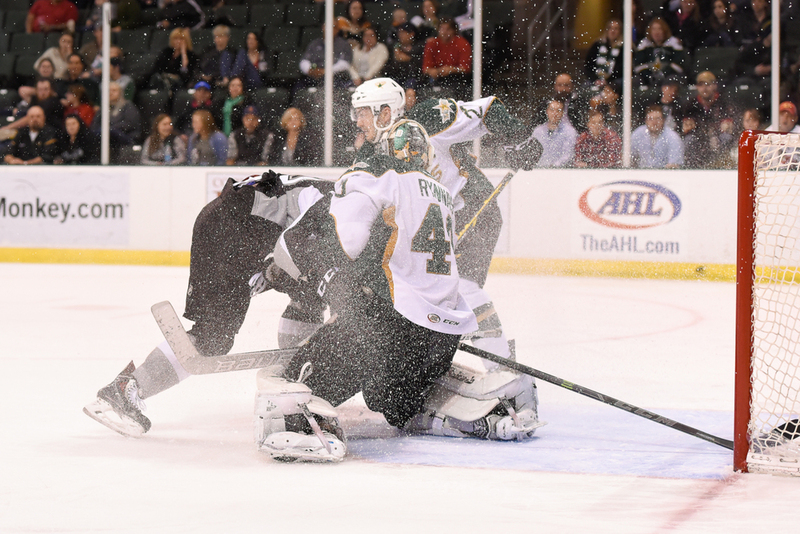 The Stars drove hard to the net and matched the physical game typical of the Rampage. It was the best game of hockey I've seen from the Stars in a good while. Way to go boys! The first shot is Jamie Oleksiak tipping in what would be the winning goal for the Stars. Jamie has spent most of the season playing for the Dallas Stars, making the occasional appearance for Texas. He was pumped about the goal and asked me on the bench if I got a shot. I was happy to say I did. The second shot is Curtis McKenzie celebrating a goal. Looks like he has a little Captain in him (sorry, couldn't resist!) The third shot is a Rampage player ramming into goalie Jussi Rynnas on a drive to the net. Um, goaltender interference anyone? Today is a two-for on the 3 shots. It has been a busy week and I realized that I forgot to post some shots from the game last Sunday afternoon against the Oklahoma City Barons. 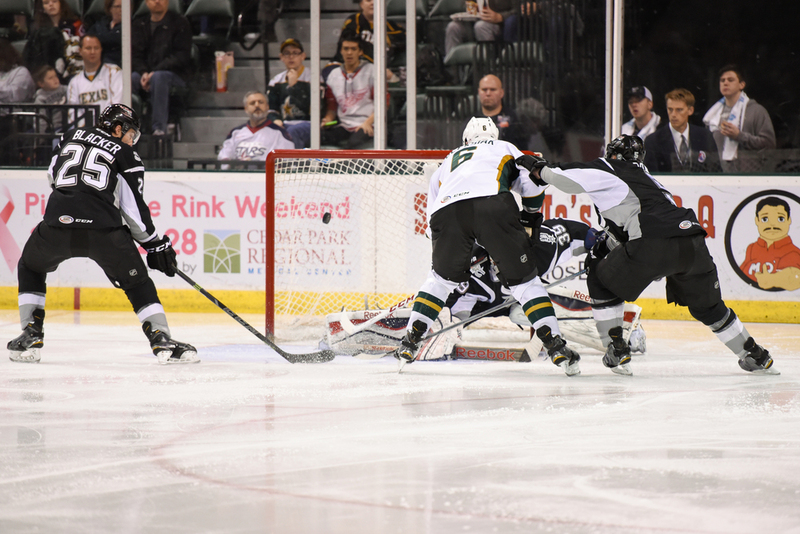 It was a good effort by the Texas Stars but they ended up falling to the division leading Barons 3-2. The first shot is of net minder Jussi Rynnas deflecting a shot on net in the first period. The second shot is a face-off scrum that was a little rough on Justin Dowling. The third shot is a good hit by Scott Valentine on an attacking Baron player.